As thin as 0.5 mm, allowing zero clearance. The Oiles Hiplast series are self-lubricating bearings composed of metallic mesh base material and polytetrafl uoroethylene plastic covering with wearresistant filler. ■ Serviceable without the need for lubrication. 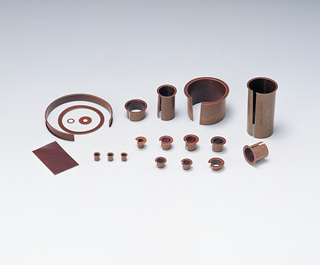 Features superior load resistance and wear resistance. As thin as 0.5 mm, allowing for a compact design. ■ Features superior chemical and heat resistance. ■ Metallic mesh offers lower thermal expansion coefficient and higher thermal conductivity than plastic bearings. ■ Press-formed and available in intended forms.